CHURCH SERVICES: Sunday, All Saints, 8am Holy Communion (BCP) 6pm Evensong (BCP) and St Mary Magdalene, 10am Holy Communion (CW). BONSAI SHOW: On Sunday at the village hall there will be demonstrations and talks by specialists throughout the day along, displays by visiting groups and societies, trade stands, advice, raffle and refreshments from 10am to 4pm. Entry £2.50 (U16s free). Enquiries 01323 731369 or visit www.eandwbonsaiclub.co.uk. GARDEN TRAIL: On Sunday there are five gardens open for Charity from noon to 5pm as part of the National Gardens Scheme in Herstmonceux. You can buy a ticket for £6, children free, at any of the gardens which will give you access to the other four. There will be teas and barbecue lunch at The Windmill and refreshments in aid of The Windmill Hill Trust. The first is two acres, created in 1980s by a nurseryman’s love of plants. Cowbeech House is a Grade II listed building from 1731 and has an ancient chantry. There are scenic views and more than one surprise in this garden. The Allotments, Stunts Green opened in March 2009, and consist of 54 parish plots. 1 Elm Cottages is a small gem of a garden with flowers, fruit and vegetables and is truly inspirational. Montana is a charming, romantic village garden on the village outskirts, planted for year-round interest and colour, with creative touches throughout. THE DRAWTONES: This jazz, funk, contemporary show is at Herstmonceux Castle on Sunday at 7.30pm. Tickets are £15 from wegottickets.com. WOMEN’S INSTITUTE: The next meeting is on Wednesday June 20 at 7.30pm in the village hall. The speaker will be Alan Cooke who will be talking about Magnetic Therapy for Pain Relief. Visitors are always welcome to come along and join in for a payment of £3, to include delicious supper-time refreshments. Herstmonceux WI are also collecting poppies, one from every household in the parish, for the World War One commemoration. These can be made in any kind of fabric or material and they hope to run a workshop for this soon, and all will be welcome. Watch this space for more information. LONG LADY OF HAILSHAM: The open day of the herb garden will be June 23 with stalls at the Herstmonceux Health Centre. WALKS GROUP: On Sunday meet Sue (832016) at 10am at Hailsham Leisure Centre for a 6 mile three churches walk. Bring a picnic. 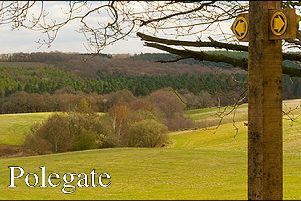 On Tuesday meet Sally (07879 925813) or Judith (01323 845769) at Dover Road, Polegate at 6.30pm for an evening walk of 3 to 4 miles in the Polegate area. Please ring the walk leader to register and let them know you are coming along. THE WINDMILL: Next Friday, June 15, there is an opportunity to join the Friends of the Windmill at Windmill Hill at their current members open evening from 7pm to 9pm. Enjoy an exclusive evening tour of the windmill followed by a glass of wine in the roundhouse. If you are not yet a Friend you can join for just £5 a year. Join on the night or in advance. Ask for an application form.